While Shayla may go with nearly everything in your wardrobe, it’s anything but neutral. This gold stunner is perfectly balanced, mixing a delicate gold chain with two hand-crafted strands of gold spheres and multi-color cubic zirconia. Finished off with a pear-shaped green crystal drop in a gold-dipped bezel setting, the Shayla Medical ID Bracelet is a Lauren’s Hope Signature Style, exclusively designed and crafted in our Kansas City studio. Your Shayla Medical ID Bracelet pairs with any custom-engraved Lauren’s Hope medical ID tag, keeping what’s truly most important to you right at hand. 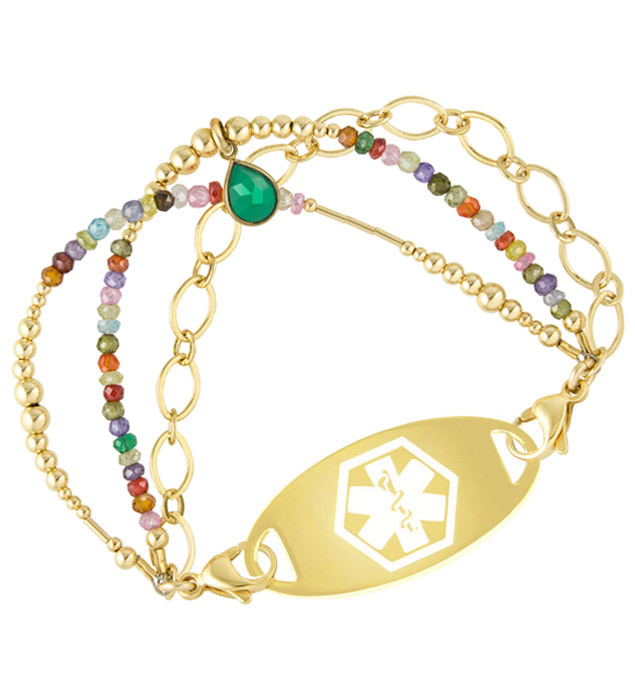 This stylish med ID is a great choice whether you or your loved ones wear medical alert bracelets for a history of weight loss surgery, celiac disease, epilepsy, Long QT Syndrome, or any other chronic medical condition or treatment consideration. Custom engraving allows you to choose the look you want so you can stay safe in style.